Across Canada and around the world, our Fellowship National staff minister to, and with, our pastors and missionaries wherever they may be found. Come along with us on several of the latest journeys; occasionally the opportunity presents itself to travel with some familiar faces on the local and international scene. 1. Visiting with Pastor Peter Spragg and the Emmanuel Church family in Bloomfield, ON… a church that’s grown from 60 to 600 in eight years. 2. Your Fellowship National Staff and family at 2013 Christmas Staff party. 3. Three professors host an FNC workshop on Models of Baptism and Membership… lots of Q & A in this workshop. 4. Visiting Richard and Brenda Flemming in the D.R. Congo… helping churches better mobilize for missions. 5. Visiting with Andy and Janet Wildsmith in Kenya… Africans being trained for ministry. 6. The official photo to mark Steve’s journey as part of Prime Minister Stephen Harper’s recent visit to Israel. 7. The Prime Minister and President Steve Jones with other evangelical leaders in Israel. 8. STM Coordinator, Chris Middleton took a trek to the latest church plants in Indonesia with missionaries Edwin and Helmi Karwur. 9. Chris Middleton surveyed some of the damage done by flooding in Indonesia on behalf of FAIR. 10. Chris Middleton interacting with students at Indonesian Theological Seminary. 11. Chris Middleton (right) with Helmi and Edwin Karwur. It happens every year. Fellowship National Conference is a moment in our history when we come together as a cross-Canada community of faith to celebrate who we are, what we do, and how great God has been among us. This year’s speakers, a quartet of our own church-planting pastors, reminded us of our roots in the Gospel and spurred us on to break through barriers to join the cross with our communities in a fresh, new way. Led in worship by Jeremy Johnson and his team from South Delta Baptist Church, and challenged by our Regional Directors, Ministries Directors, Missionaries and Church Planters, it was a jammed-packed few days. 5. Opening night at Fellowship National Conference with President, Steve Jones, in the front seat. 6. Fellowship Pacific Regional Director, David Horita, welcomes the delegates accompanied by Women’s Ministry Director, Krista Penner and Colin van der Kuur, Church Reproduction Director. 7. Fellowship International appointees to Spain: (l-r) Ingrid Castro, Kathy Yinger, Ricardo Castro, Ken Yinger. 8. Fellowship Atlantic Regional Director, Glenn Goode. 9. Brad Somers, pastor of Pax Church in Halifax, Nova Scotia. 10. Raj Vannadil, appointee to India with Fellowship International’s LeadersFor. 11. Steve shares his vision for Project 2014: Refueling Our Mission, Destination: Francophone World. 12. Steve shares a lighter moment with Fellowship staff member, Gwen Pifer. 13. Chatting with the delegates. 14. Traffic jam in the hallway. 15. Theology workshop Leader, Dr. Stan Fowler, discusses baptism. 16. The panel for one of the theological workshops: Stan Fowler, Brian Rapske and Kent Anderson. 17. Fellowship Pacific’s Women’s Ministry Director, Krista Penner, leads a workshop. 18. David Dobson, Director of Fellowship Ministries, explains the future of the Fellowship French Mission. 19. Conference speakers share their views on ministry issues in one of several workshops held during the conference. 20. Being led in worship. This year’s conference celebrated the 50th anniversary of Fellowship International and resulted in a reunion of “oldies” and “newbies” that delighted the heart and spurred again the desire to reach out into the world on our doorsteps and the world beyond. 21. Veteran missionary, Elsie Slaney, appointed in 1958 to Japan with her late husband, David, enjoys a moment with Don Rendle, early missionary to Colombia, South America. 22. Paul Kerr, former Director of Fellowship International interviews Bob and Evelyn Rempel. The Rempels went to Colombia to serve a two-year term and stayed for 17 years! 23. Joan Braunberger, who served in Pakistan with her late husband, Herman, visits with Alice Nordstrom and Claudia Cardona (Colombia) at the Fellowship International breakfast. 24. Three of the early missionaries to India (l-r): Paul Kerr, Colin Butcher and Vern Middleton. 25. Fellowship International Director, Dan Baetz, in intense conversation. 26. Larry and Barb Gustafson, former missionaries to Pakistan, catch up with Fellowship International’s first missionary to Pakistan, Hannah Pollock Leutbecher. Join us in beautiful BC for the FELLOWSHIP NATIONAL CONFERENCE as we celebrate the Fellowship’s 60th annual National Convention and the 50th anniversary of Fellowship International. Come on mission with our Fellowship’s next generation of pastoral leaders. Learn why they’re in love with the local church and its mission. Hear their own inspiring church-planting journeys. 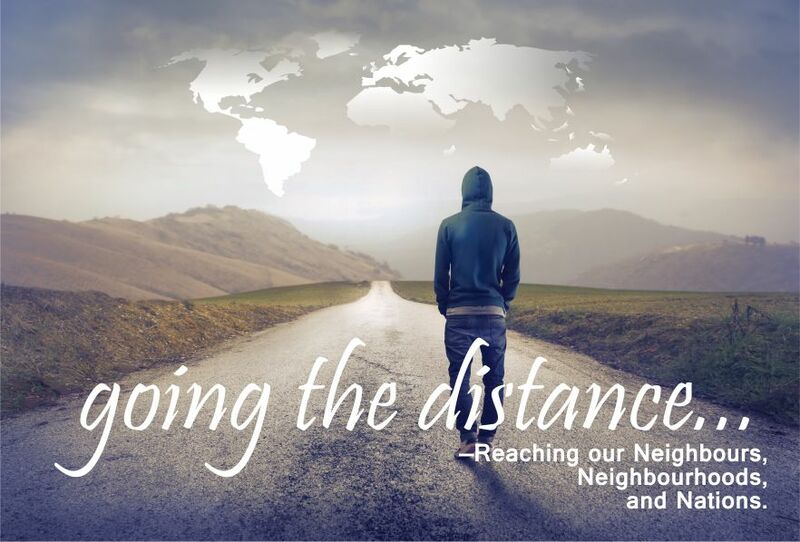 Be challenged to participate in the mission to reach our NEIGHBOURS (evangelism/discipleship), NEIGHBOURHOODS (church planting) and the NATIONS (global impact) for Christ. The Wednesday night banquet will focus on Fellowship International. Over the past 50 years close to 300 missionaries have been sent out to reach the nations—we have reason to celebrate! Get your copy of Ordinary People with an Extraordinary God, containing some of the stories of those fifty years of God’s faithfulness. Joe Boot, Lead Pastor, Westminster Chapel at High Park, Toronto, ON Joe and his team planted Westminster Chapel four years ago in the heart of Toronto. They have grown from 25 to approximately 350. Mark Clarke, Lead Pastor, Village Church, Surrey, BC Village Church, in the fastest-growing city in BC, has grown from 16 people to a multi-site church with over 1,700 people meeting weekly. Marc Pilon, Lead Pastor, AXE21 Church, Sherbrooke, QC The AXE21 Church was launched in 2011 with the help of Project Kick Start. In its first 18 months, the congregation grew from 120 to well over 400 people. Aaron Rock, Lead Pastor, Southwood Community Church, Windsor, ON Aaron and his wife were the only two back in 2001 when Southwood was launched. Since then the congregation has grown to 450 people and has been instrumental in planting three other churches in Essex County. For further details on the Fellowship National Conference and to register, check out The Fellowship website at www.fellowship.ca and follow the links.